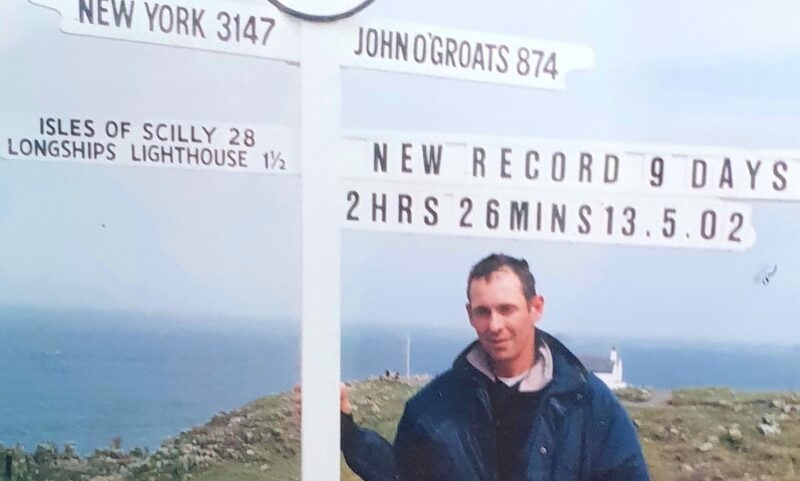 The John O’Groats to Land’s End (JOGLE) running record was recently in the spotlight as Dan Lawson attempted to break the nine days and two hours set by Andi Rivett in 2002. Now concerns have been raised over its legitimacy. 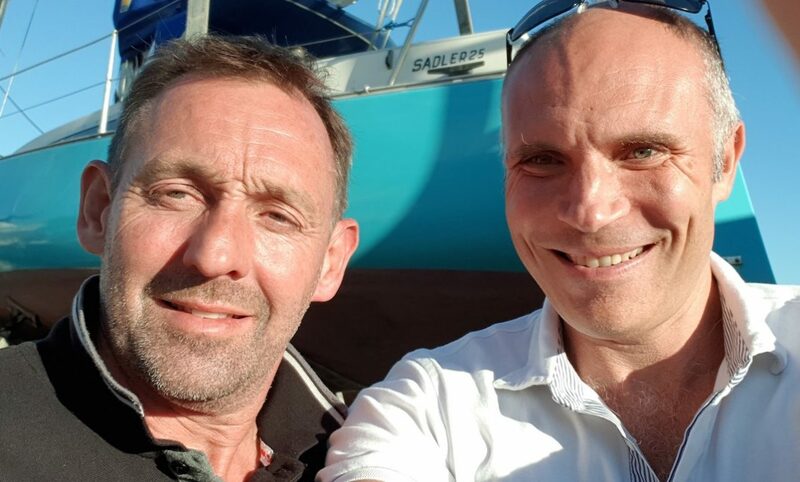 Will Cockerell, marathon runner, sportswriter and author of ’50 greatest marathon races of all time’ took the time to visit Andi Rivett in Rye, East Sussex and below is his analysis of the meeting and the record set in 2002. I travelled to Rye, East Sussex on September 27, 2018, to meet with Andi Rivett. The aim was to discuss his John O’Groats to Land’s End record and gain some insight into this amazing feat. Due to the eye-watering quality of the record, and the length of time it has stood, it has some scepticism in the ultra community, although Rivett is unaware of this. The shipbuilder was welcoming and clearly very fond of running. However, the paradox is that for someone who holds an endurance record of such splendour, his attitude to times, racing and statistics is ambivalent. The run is a significant feat due to its iconic and challenging nature and is similar in appeal to, say, the Channel swim or the US Transcend [The 3,100 mile run from one side of the USA to the other]. Rivett appears on websites nestled alongside Usain Bolt, Paula Radcliffe and Roger Bannister which list the greatest running feats of all time, so has his name in the sport’s folklore. Rivett began running as a seven year-old in West Yorkshire due to his asthma and found it relieved the symptoms. There was a solid but unimpressive running career in school. There was a story that the people he beat in cross country would get detention, so he enjoyed the feeling that gave. This though does though give the impression he was lowly rated by teachers. After school, he went into the boat building business, where he remains today, aged 54. He was 38 year-old at the time of his the JOGLE run. Although his asthma got better after school, he was now in a very dusty business and found that going for a run would clear the lungs. I asked Rivett about his best times, and although personal bests over shorter distances aren’t everything for an ultra runner, they still tell a tale, and runners generally know their PBs. He struggles to provide his best times with any certainty, and always has to stop and reflect, which is unusual for a runner, given the enormous effort we go through to achieving them. He then said he went “Sub nine for the chase” – which I challenged him on, and he agrees he must be mistaken on his steeplechase mark, but is sure he went sub nine minutes for the 3k flat. Big difference. Half marathon: 70.30 at the Great North Run. The marathon was “never important, never chased times” but he points to a 2:48 at Stratford. His Power of 10, the database for all running times in the UK, denotes just two performances in his entire 36 year senior running career. By way of comparison, marathon and ultra runner Chris Finill of similar age has 261 races denoted, I have 356 (10 years younger), JOGLE female record holder Mimi Anderson has 14, of which 9 are ultra runs, and Dan Lawson who recently had an attempt at the JOGLE record, has 22 performances of which 14 are ultras. AR’s two denoted performances are both in 2004 and are a 34:32 10k at Wakefield and 75:37 at Blackpool. Both solid performances for a 40 year-old, but only that. They placed him 147th and 69th M40 for that year, and his 10k was the 1,173 best in the UK. The Yorkshireman attempted to run the 24hour track run three times, but found big difficulties in it. He failed to finish twice, and the first attempt was 125 miles. It is worth noting Rivett set the Guinness World records for 100 miles and 24 hours on a treadmill, but doesn’t know what he ran, and they were very short-lived. He gave all three of his Guinness certificates to the White Horse pub seven miles away in Newenden, who have taken them down, and now they can’t find them, so the distance of the treadmill run is lost. Rivett did the Marathon des Sables in 1998 and says he placed 19th and second British athlete, although I have not seen the verification. His first attempt at JOGLE was 18 months earlier, but he had shin splints, which orthotics cured. Upon searching there are further records, like several 34 minute 10k efforts. He drove up to John O’Groats two days before he began and in the support motorhome was his physio Penny, (he doesn’t know her surname), her partner, and their family (a toddler and a newborn). I believe there were one or two other supporters, who would be on bikes around 50% of the time, names not supplied and perhaps not known. To verify the run, lots of photos were taken of Rivett by his supporters throughout the run and sent to Guinness, and when they passed a policeman they would ask him to sign a form saying that they had seen him running by. The run started at 6am on the first day, but midnight all the others. Initially, when asked how much he was doing a day, he said 18 hours, but I clarified to mean distance, to which he replied 90 miles. It’s very unclear what the distance was exactly and the picture denoted at the finish line says it’s 874 miles. So he would actually have had to run 96 miles a day. The run took place in very good weather, except for terrible conditions on the last one and a half days, which didn’t affect him. 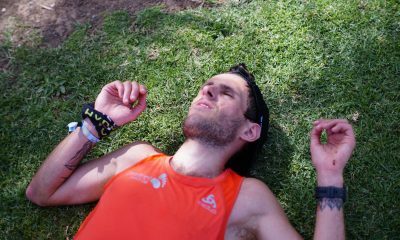 No injuries, but he felt awful on the third day, which he expects meant that he had to run for 20 hours, not 18. He bounced back well thereafter and never slowed down on the run, or hit further trouble. The trick he says is all psychological and to break the run down into 10k segments. Never wait till you get hungry before eating. He had physio and acupuncture in the evenings. He had one ‘injury’ when someone stepped out in front of him, he landed heavily, which triggered a blister on his instep. Both feet turned “black”, but neither that, nor the blister, affected his running. The intention was to give himself a one day buffer on Richard Brown’s record, on the assumption that he would slow down, but he never did. I enjoyed meeting Rivett and liked him as a person. I want to believe that his record is genuine, but I have grave doubts. – His lack of clarity or verification of his PB’s is frustrating. 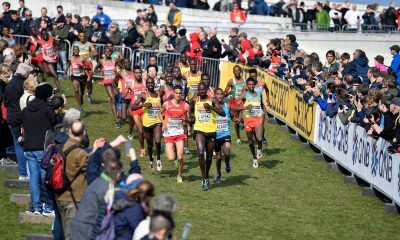 – To say he went sub nine for the steeplechase, which has one in the mix in the early stages of an Olympic heat, is very odd. – Track and road runners are notorious for knowing precisely what they’ve done, especially their best results. – He has to think hard about any PB and it’s usually more of a ‘stab’. – The difference between the 31 minute 10k mentioned and a 34 minute we have record of is huge. – The 2:48 marathon is an awful conversion for a 31min 10k & 70 min half man. It’s easily the worst conversion rate of a half marathon to the full 26.2 miles I’ve ever seen. Rivett says he never really went after the marathon etc. but he also says that his approach to life is to do the absolute best at anything he tries. He either hasn’t tried at the marathon distance or really struggles at it. His 132 mile best for the 24 hour track run is again poor for his pedigree. With the other two attempts being DNFs (Did not finish), the event has found him out. 132 miles is not a good conversion for a 2:48 marathoner and could be achieved by a good 24hr runner with well over a three hour marathon PB. He would not be winning the ladies race in a small field. His distance is 57 miles off the world record. A huge amount considering he holds one of the dominant ultra-running records in history, which is comparably stronger than Yiannis Kouros’ 1000 mile mark. He describes women’s JOGLE record holder Mimi Anderson as a ‘fabulous’ runner, but his JOGLE time is 85 hours superior. This is a grave anomaly when one considers he is not even winning a women’s 24 hour track race. His marathon best is only 50 minutes better than Anderson’s, and the JOGLE is 32 marathons. Thus, he should be beating her by around 26-27 hours, or a little over a day. But he’s beating her by over three and a half days. 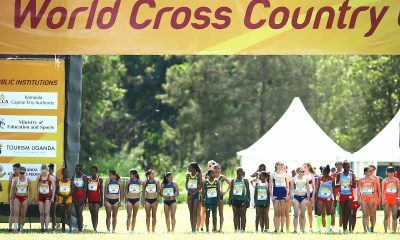 The men’s world records in athletic fields tend to be 1.1 times quicker than the female equivalent. AR’s is 1.38 times superior to his female counterpart. This could be explained by the underdevelopment of ultra running’s records though. World records tend to be 0-3% superior to the next mark. AR’s is 11% better than Brown’s. Aside from the JOGLE record, Rivett has displayed an aversion to racing in the public eye. Hence his name is all but absent from Google or the Power of 10. For such a dedicated and driven runner, this is almost unprecedented. AR’s JOGLE record does not tally with American Transcon record-holder Pete Kostelnick whatsoever. Kostelnicks’ Transcon, when converted to JOGLE by a pace calculator, gives him 10 days and 8 hours. 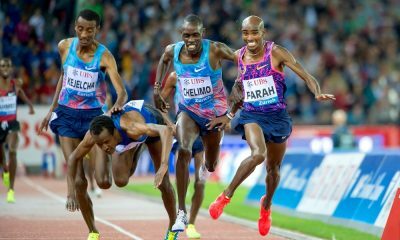 His US crossing time of 42 days in 2016 was deemed outstanding, often running at sub 10 minute miling. On the flip side, AR’s Jogle record is worth 36 days for the Transcon or 84 miles per day. 12 miles a day superior to Kostelnick’s 72. It’s odd that Rivett is only able to provide a single name, Penny, who he’s not in touch with, for his entire support staff. Her family, of a toddler and newborn, are of course non-witnesses. The verification process of getting police officers to sign a sheet when he ran by them would not be accepted in this day and age. The same could be said for the photo evidence submitted. Alone these do not prove anything beyond a moment’s running. It strikes me as very strange that he began each day’s running with a wake-up call at 11:45pm to start at midnight. It’s such a harsh time to start the day. Most start just before dawn to align with the body’s natural rhythm and maximise daylight. It is strange to run those 36 extra hours in darkness, without witness en route. When I asked him why the run started at midnight each day, he said he had “no idea”. Kostelnick’s time for running across Iowa is 423 miles in seven days. Rivett is covering 830-860 miles in nine. It’s a stunning differential. Kostelnick has a distance of 163.6 miles for the 24 hour run, compared to AR’s 132. Rivett ran nearly the same pace for his JOGLE as he did for his only completed 24 hour run. This was 99 miles per 18 hours, compared to 96 for day six at JOGLE. Rivett says the challenge began at 6am on May fourth, but this is not noted in Guinness’s record, (which it should be). He ran 90 miles a day and (and 96 miles on the sixth day). This means the logistics of the run are over before they’ve begun. For instance, how did he manage the 90 on day one with a 6am start? It will have taken him till midnight. But that’s when day two’s running began. The attempt has become a logistical nightmare after the very first day. It is missing six hours. Having studied this case closely, I do not quite see how the nine day, two hour mark is possible. It may be a simple clerical error like starting on May 3rd instead of May 4th. Actually, May 4th to 13th is a 10 day spell anyhow, which is where the start time and finish for the race are vital, but not logged. But the above analysis tells us these facts: Rivett struggled badly at both the marathon and 24 hour run; the JOGLE record in no way tallies with the runs of Kostelnick and Anderson or his 24 hour run; the witnesses are all but unnamed; his verification via photos and police signatures are of little use; and the superiority of 11% over the next best attempt is very severe. One third of the run needlessly occurring in the dead of night is very troubling. I have shared these observations with Guinness World records and await their response. I also contacted Rivett and asked for comment on the above analysis and his response through a Dr R Gilbert, is below. All in all, it has been an interesting investigation, with many questions raised. The Guinness world record process, whilst met, was clearly not infallible. Whilst there may be no hard proof that Rivett did not complete the run, there does not seem to be much proving he did either. We’ll leave the final comments to Richard Brown, former JOGLE record holder, who has read the analysis above.